The Grand Jury has received a legal opinion from the San Mateo County Counsel to the effect that the California Taxation and Revenue Code 96.8 authorizes a hospital district such as Sequoia Healthcare District to request the county auditor make a tax reduction in any amount down to zero for the district’s taxpayers on a yearly basis WITHOUT THE REALLOCATION OF THE REDUCED TAXES TO OTHER AGENCIES. I believe the editors clearly understand how the political machinery functions. it was the GRAND JURY. Second: “by law the money will continue to be collected but distributed to the remaining special districts.” This is simply a deliberate false statement by the Almanac. 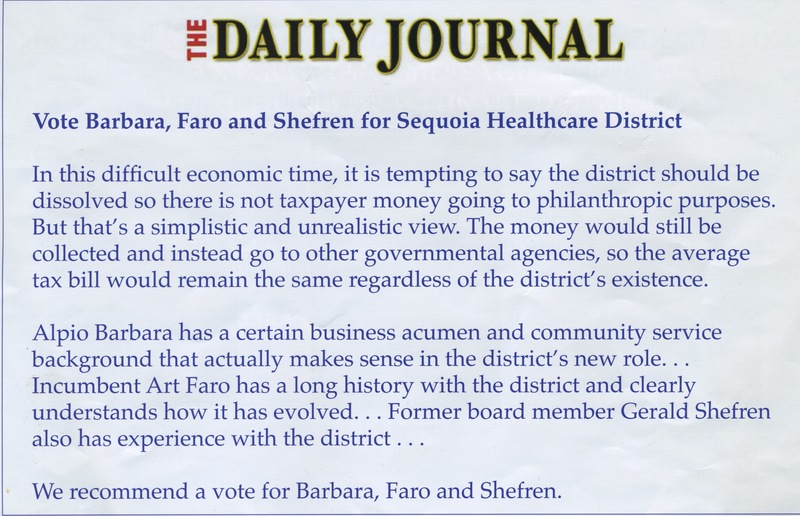 The Sequoia Healthcare District should reduce property taxes for district taxpayers unless in a future election district voters approve expenditures for purposes not approved by district voters in the 1946 measure establishing the district or in 1996 Measure H. This reduction would equal the amount expended by the district for purposes not approved by the voters in the 1946 measure or in 1996 Measure H and effectively limit district expenditures to those purposes approved by district voters. By this reduction in property tax receipts to be requested under the Revenue and Taxation Code 96.8, property taxes would be lowered for all district taxpayers. When you see the word Board/District think 5 People. Here is the response to the GJ report above. I think the Almanac owes the Taxpayers and voters of San Mateo County an explanation. Hickey, Graham and Stogner were only going to do what 2 Grand Jury’s recommended.